Listen! 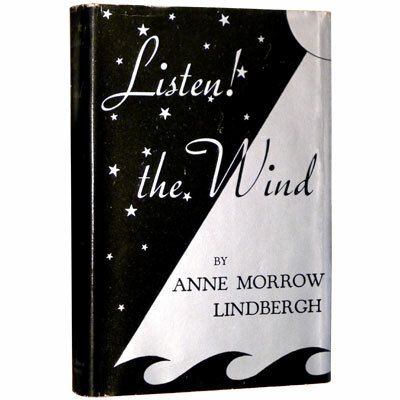 The Wind - Anne Morrow Lindbergh 1939 - Harcourt, New York - First Edition	A lovely copy – in its striking original dust jacket and scarce glassine wrapper – of Anne Morrow Lindbergh’s beautifully written account of her and her husband’s 1933 flight in their single-engine Lockheed ‘Sirius’ from Africa to South America, as they survey 30,000 miles of coastal aviation routes across the Atlantic Ocean. With a foreword, and map drawings by Charles Lindbergh. Listen! The Wind was awarded the National Book Award for non-fiction in 1938. When Anne Morrow married courageous, solo adventurer and aviator Charles Lindbergh in 1929, her life was destined never to be the same. Her flying education began soon after her wedding, and in 1930, thanks to the expert guidance of her husband, and her own ingenuity, Anne became the first woman to earn an American glider pilot’s license. Along with her skills as an aeronaut, she also became an accomplished navigator and radio operator. In 1934, Anne became the first woman to be awarded the National Geographical Society’s Hubbard Gold Medal, presented with this accolade as recognition for her exploration, research, and discovery. Anne continued to fly as Charles’ co-pilot, travelling with him across Africa and South America, as well as on polar air routes from North America to Asia, and Europe. She was also his navigator on a trip across the US, flying from California to New York in just under 15 hours. At the time of the flight, Anne was seven months pregnant. Along with her remarkable aerial adventures, Anne also went on to be a best-selling author, writing several travel memoirs and articles, as well as ‘Gift from the Sea’, a seminal work of inspirational, feminist literature. References: Pace, ‘Anne Morrow Lindbergh: Champion of Flight and Women’s Concerns’ The New York Times 2001. Lindbergh Foundation, web. Gherman, Anne Morrow Lindbergh: Between the Sea and the Stars 2008.